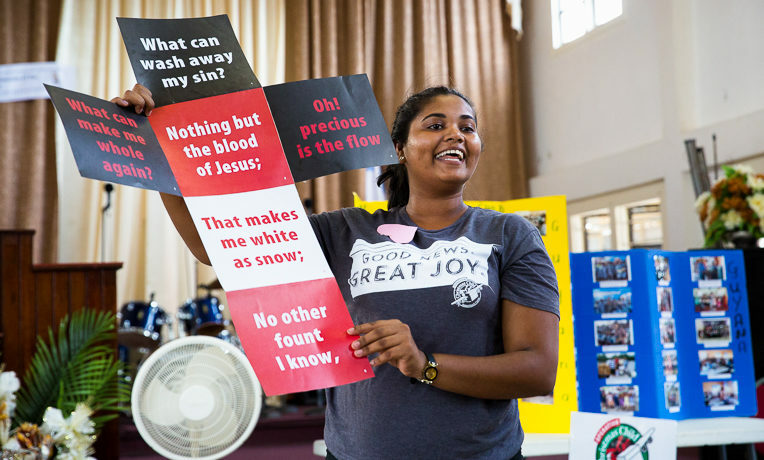 CHRISTIAN LEADERS IN GUYANA LEARN HOW TO SHINE A LIGHT IN THE DARKNESS TO CHILDREN THROUGH THE GREATEST JOURNEY COURSE. Teaching is difficult in Guyana, Latin America. Educators often lack basic supplies, training, and support. But that is beginning to change thanks to The Greatest Journey and Operation Christmas Child. 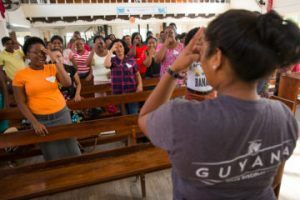 GEETA DEMONSTRATES A SONG WITH HAND MOTIONS THAT CAN ENGAGE CHILDREN WITH THE GOSPEL. 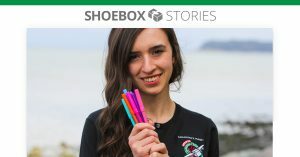 In Linden, an interior mining town, a group of men and women gather to learn about how to teach The Greatest Journey, an optional 12-lesson Bible study course offered to children who have received shoebox gifts. 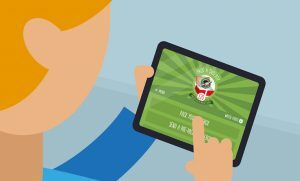 The programme allows children to discover, follow and share Jesus. The group are young and old, Sunday school and public school teachers who are all volunteering their time to serve Christ. For many, the event was the first time that any of them had experienced educational training of any kind. “I realised that I need to change my teaching strategies,” said Odessa, a trainee at the event. 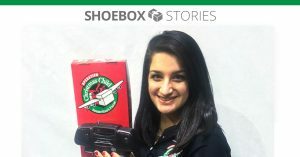 A teacher herself, she was impressed with the training provided by the Operation Christmas Child National Leadership Team in Guyana. 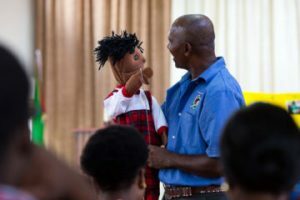 NEVILLE REMKISSOON DEMONSTRATES WITH A PUPPET HOW TEACHERS CAN ENGAGE CHILDREN WITH THE GOSPEL MESSAGE. The training provides teachers with materials to lead children through The Greatest Journey, a New Testament for each child, and a framework to continue writing lesson plans. And they are seeing the impact of their efforts. The Greatest Journey is building up a generation of Christian leaders who we hope can address problems that have deeply impacted the country and the church. Currently, Guyana has the world’s highest suicide rate. Though there is no definitive cause, some of the contributing factors include poverty in rural areas, the prevalence of alcohol abuse, and easy access to deadly substances. Many of the children within The Greatest Journey speak of the trials and challenges they face at home. THE GREATEST JOURNEY TEACHERS RECEIVE MATERIALS AND SUPPORT. “One child drew a drawing about their parents with a stick and a bottle,” said Neville Remkissoon, a pastor and volunteer with the National Leadership Team. 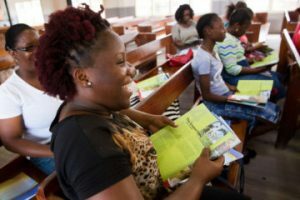 Neville helps train and equip teachers to minister to children through The Greatest Journey and to share the light of the Gospel during some of their darkest times. “Let your light so shine before men, that they may see your good works and glorify your Father in heaven” (Matthew 5:16, NKJV).